We perform moisture testing on all types of siding, not just stucco. Other wall claddings are certainly not immune to moisture intrusion, and we can test most of them for moisture intrusion. 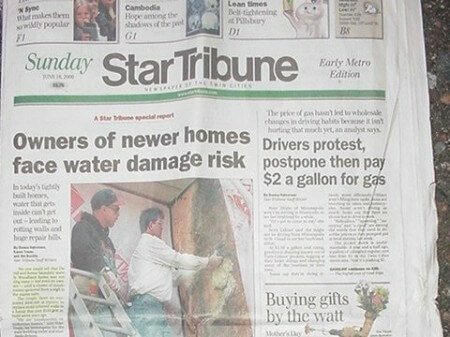 Barry Eliason was featured in a front page Star Tribune article in January of 2000 which discussed moisture intrusion in existing homes. Stucco was fingered as the siding with the largest problems, but the cover photo was actually a home with vinyl siding. Click the photo at right to read the entire article, which we’ve copied to our blog. Pin-probe moisture testing of stucco houses is our bread and butter. We prefer to perform exterior testing, but we can also perform interior testing if needed. We offer non-invasive moisture testing on vinyl siding. Aluminum and steel siding can be pin-probe tested from the interior of the home only. Brick siding can be tested with pin-probes. Wood siding can be moisture tested with non-invasive surface scanning, and then followed up with pin-probe testing at suspect areas. Composite siding, such as James Hardie or LP Smartside, can be tested the same way that wood siding tested, using a combination of non-invasive and pin-probe testing.